Eager and adventurous, energetic and endlessly curious––your child approaches each day at full speed, and they need clothes that can keep up. adidas kids’ clothes blend comfort, durability and style for designs that feel good, look fresh and hold up. During our kids’ apparel sale, save up to 50% on adidas gear for boys, girls and toddlers. Even on off days, young ones stay moving. With these discounts, you can stock up on adidas kids’ clothes that keep your children comfortable and cool in the classroom, on the playground and during all their favorite activities. Find iconic kids’ track suits in a range of fun colorways, kids’ hoodies with classic logos and fun prints, along with sport-ready youth soccer jerseys and shorts, adidas kids’ tees and more. With savings up to 50% off, your child will be ready to suit up and own the day. It’s never too early to start creating. Whether your young ones are scooting across the floor, lounging in their stroller or practicing their steps, adidas offers ultra-comfortable, age-appropriate apparel suited for exploration, relaxation and everything in between. 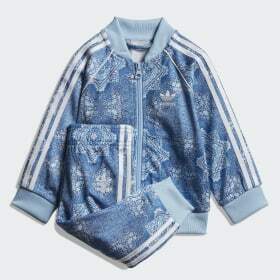 Deck out your little one in an infant adidas track suit with soft fleece fabric, a comfortable elastic waist and stylish graphics. Mix and match their new outfit with 3-Stripes tees, shorts and adidas infant shoes on sale for a stylish, sporty look.